The Blackhawk Sportster is great for shooters who desire a single holster for multiple pistols. 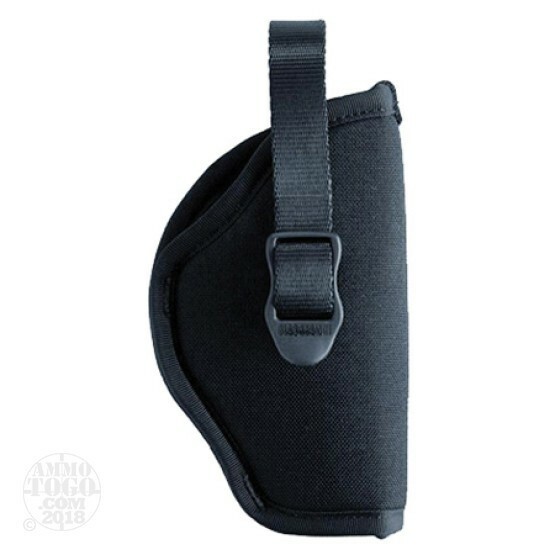 The body of this holster is made from durable 600 denier polyester which resists moisture absorption and won't mar the finish on your favorite handgun. Extra stitching can be found at the most stressed points of the holster behind the trigger guard and under the muzzle for increased longevity. Durability is further improved by a nylon spine sight channel which prevents sharp and blocky pistol sights from tearing through any material. This right-hand soft-shell Sportster is designed to maintain its shape when the firearm is not present; this assists consistent, one-handed re-holstering which is a safer and more expedient practice. For retention, an adjustable nylon strap reaches across the back of the pistol's slide and snaps securely to the right side of the body; the snap has a enlarged plastic lip which makes intentional unbuckling very simple. This holster fits Blackhawk's size 8 for medium and large semi-automatic pistols with barrel lengths of 3.25 inches to 3.75 inches. Its belt loop accepts belts up to 2 inches wide and offers a medium ride height for a comfortable draw.